Join Kristin Cork for a transformational, healing week basking in the warmth on the Pacific Ocean. Stay in one of ten thoughtfully, individually designed free standing bungalows. 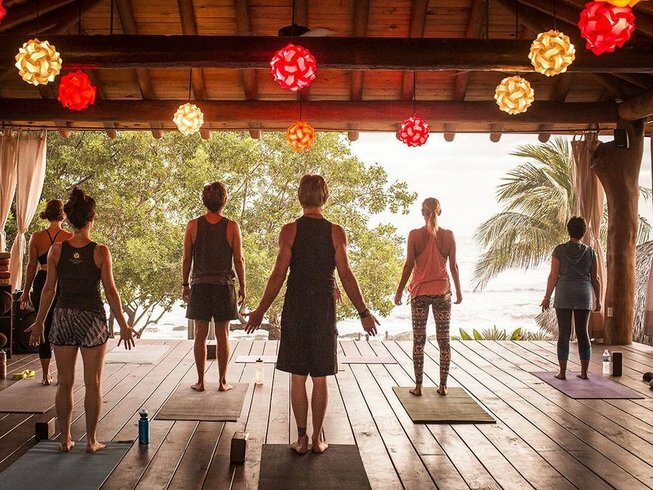 Each morning with Kristin there will be meditation & yoga oceanfront and then an amazing organic breakfast awaits you under a shaded pavilion on the oceans edge. Swim, stroll, surf, read or rest by the pool or ocean recharging and reconnecting. As the day progresses consider take another yoga class, qi gong or dance class taught Present Moment movement staff. 3-4 movement classes offered each day are an option.. do as much or as little as you want! Truly, each day is about relaxing, receiving and releasing. The gift of slowing down and moving into stillness where our lives can catch up to our spirits. Kristin has traveled several times to Present Moment, each experience insightful,inspiring and nourishing. Join her and peel back the layers to reveal and brighten your inner light! 7 Nights Ocean View Accommodations * Gourmet Breakfast and Dinner daily Daily Morning Meditation & Yoga with Kristin diving into asana, alignment, breath and energy bodies * Qi Gong/ Dance /Gentle Yoga Options Daily taught by Present Moment Instructors * An adventure excursion of horseback riding or kayaking * Transfer to and from airport on days listed * All Government taxes *trip of a lifetime! 20 Continuing Ed Credits will also be earned by participating in kristin's classes! Airfare * Beverages at Resort * Additional Meals * Spa treatments * Extra Adventure Excursions * Flights should arrive / depart from Ixtapa / Zihuatanejo airport (zih airport code). Taxi service is included on arrival/ departure days from airport to resort.